With CDvLB, enterprises can easily and flexibly scale their network performance as internal and external traffic demands increase. IT organizations achieve greater control by automating virtual server resource allocation, and aligning virtual server resources to meet business needs, such as scaling to meet growing traffic demands, data center consolidation, ensuring business agility and disaster recovery, and improving application delivery performance. Service and Cloud providers can create monthly “pay as you grow” revenue generating services. Additional on-demand CDvLB instances can be deployed by their customers to meet growing network traffic demands. Because of the cost-effective nature of deploying CDvLB, customers can provision a dedicated CDvLB instance to manage a specific application. CDvLB can be integrated into service offerings, either manually, or by using Resonate’s APIs, and bill customers based on metered usage. Service providers have complete control over their customer relationship, and are able to establish their own payment terms and pricing. 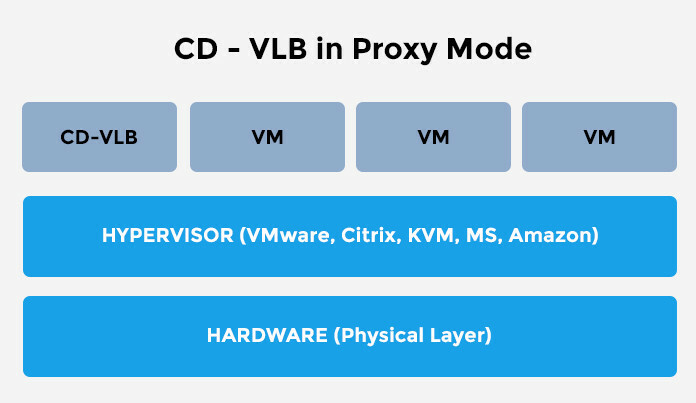 CDvLB for deployment in proxy mode requires no server agents, and comes with options for perpetual software licensing or annual subscription-based licensing. One year of product support is also included. CDvLB is available to support an enterprise and its subsidiaries. Administrators can purchase additional “pay as you grow” CDvLB subscription licenses for three or more content nodes nodes. CDvLB for native mode deployments includes server agents for all nodes. Pricing is available for perpetual licensing, or annual subscription licensing. Product support is included for one year. Additional CDvLB “pay as you grow” perpetual or subscription licenses can also be obtained for adding new nodes.